I will be flying to Omaha, NE, in the morning and then renting a car to drive to Lawrence, KS, to preach Sunday morning for Pastor Scott Hanks. This will be my first time to preach for the HERITAGE BAPTIST CHURCH in Lawrence. I knew Pastor Hanks’ dad the late Pastor John Hanks very well and I am looking forward to preaching for his son Sunday morning. I will then drive 3 hours to be with Dr. Raymond Wicks who pastors the FIRST BAPTIST CHURCH of Plattsmouth, NE, after the morning service for a 6 pm service. Dr. Wicks and his dear people have just moved into a beautiful new facility. I have followed from the beginning of its inception through the planning stages to the completion stage. I am very excited to see the finished facilities. My son Dr. Scott Gray will join me on Sunday night and for a special Monday night service. I am looking forward to sharing the pulpit with my son. I have two sons who are men of God and I am extremely excited for them. My son Bob II is the pastor of the LONGVIEW BAPTIST TEMPLE now and is doing a tremendous job. The church is still growing and I am thrilled to be a member! Today I attended the funeral of one of the finest soul winning layman I have ever known. I was privileged to be his pastor for 29 1/2 years. 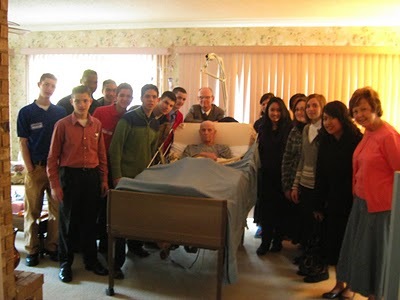 He averaged 1,000 souls saved a year for many years. He was a very quiet man until he began giving out the Gospel. When he went soul winning he did not know a stranger. He is in the presence of his LORD now and in no more pain. The picture is one of the AMERICA FOR CHRIST teams who met with him just before going out on their routes a week before Danny’s home going. Danny was a faithful member of that team for many years. God bless his memory! GOTTA LOVE SOUL WINNERS!